Prong: In a Prong Mount metal claws grip the diamond. It is very Secure and can hide certain imperfections while allowing a large amount of light through the diamond.The number of Prongs can be adjusted, as in this stunning 6-Prong design from James Allen. Halo: In a Halo setting a central solitaire is surrounded by one or multiple rows of diamonds and/or precious gems. This setting can help make a smaller solitaire appear larger, or accentuate a lower Color grade solitaire by surrounding it with 1 or 2 grade lower halo diamonds. In the example above this James Allen Halo surrounds the solitaire with Blue Sapphires. Three-Stone: A Three-Stone setting is exactly what it sounds like, three stones set side-by-side. Used symbolically the setting represents the past, present, and future of the couple. This example from Blue Nile shows a very traditional use of this setting highlited by a Channel set band. Channel: In a Channel setting a series of diamonds are placed within grooves in the channels of a ring. The diamonds are mounted flush with the ring, providing a very secure setting. 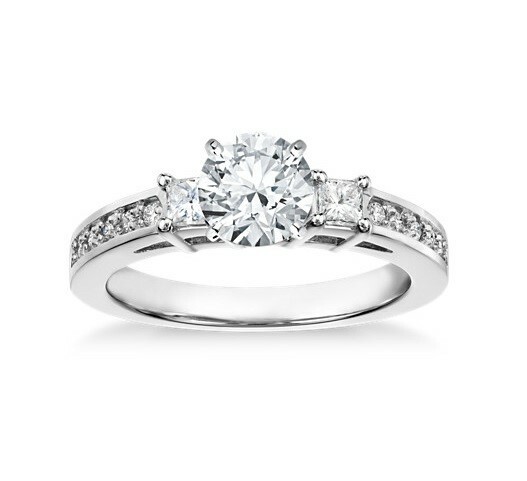 This breath taking ring from Blue Nile uses the channel to highlight the solitaire as the focal point. Additionally, the Channel setting can be duplicated for the wedding band, creating a beautiful complimentary piece. Tension: A Tension setting holds the diamond between two shanks by pressure. The contact points are grooved to provide greater security. The net result is a diamond that appears suspended within the ring. In this example from James Allen, you can truly see how the settings gives the effect that the diamond is floating between the two shanks. Antique: An antique setting is used to mimic an older style and can be influenced by different periods. The setting can combine multiple elements, such as Pavé, Filigree, Cluster and Milgrain to form complex mounts whose artwork is as much a focal point of the ring as the diamond itself. This James Allen piece fuses several elements to create a magnificent ring. Shank: A Shank style mount refers to a ring where the shank (the actual sides of the ring) split apart. The result is a very unique ring that, while not popular, is very attention grabbing. The above James Allen ring utilizes this technique as the shank splits into a floral design enveloping the central solitaire. Pavé: A Pavé setting paves numerous diamonds tightly together providing a dazzling effect. Keep in mind that this setting can be very difficult to resize. In this example from Blue Nile you can see the Pavé effect originating from the shanks and rising up through the thick prongs and culminating in the Pavé halo sorrounding the central diamond. Flush: A flush setting mounts the diamond completely within the ring leaving the face flush with the ring. This very secure setting is perfect for wedding bands and active individuals. Eternity: An Eternity setting isn't a particular mounting style, but instead identifies that the stones completely encircle the ring. As such, and Eternity ring can be made using channels, prongs, flush, etc... All are viable options as long as they go all the way around. This Blue Nile example uses a Pavé setting to completely surround the ring. Tiffany: A Tiffany setting has a very specific 6-prong design that maximizes light reflection. This type of setting can only be purchased from Tiffany & Co.
Bar: Similar to a Channel setting, the Bar setting places numerous diamonds between two grooves in the sides of the ring. Unlike a Channel setting though, a Bar setting leaves the sides of the diamonds exposed, providing a more dramatic effect. Bezel: A Bezel setting provides a rim that completely surrounds the diamond, leaving the sides either covered or open with individual prongs. While it is very secure it does mute some of the stones reflective properties. 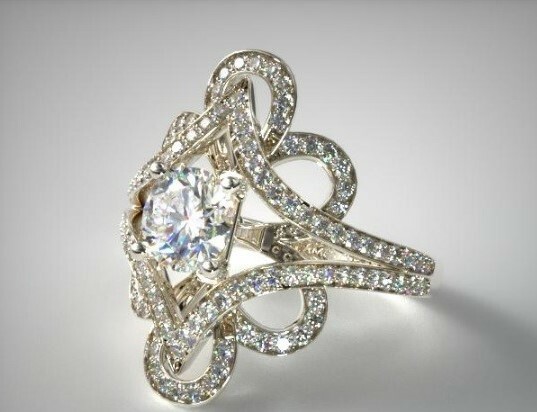 Cathedral: A Cathedral setting raises the diamond above the ring's shank with arches made of prongs or bezels. The net effect is very traditional. Cluster: A Cluster setting places many smaller stones together to form one larger stone. If coupled with a larger center stone the net effect can be a ring with a significant presence.